Woodbury Chorus and Orchestra is an arts organization that is unique in the Twin Cities. Each member is a volunteer, including the directors, and each is dedicated to helping those in need. Their primary mission is to contribute to food shelves in the areas where they perform, through proceeds of freewill offerings taken at their concerts. Members also enjoy sharing great music with their audiences, and most of them have had extensive experience in school, community and church musical groups. This organization took root at King of Kings Lutheran Church in Woodbury, Minnesota, after a senior choir presentation of Handel's Messiah during the 1984 Christmas season. A vision took shape then, of area church choirs joining together to perform Messiah during the 1985 Christmas season. At that concert, the freewill offering went to benefit the Christian Cupboard food shelf in Woodbury. From this group of musicians the Woodbury Community Chorus and Orchestra was created. In 1987, Gerrit Willem Lamain became director of the group. Under his direction, the organization has grown to its present stature. In 2010, after twenty-three years as director, Gerrit Lamain retired. Robert Murphy was selected as the new Musical Director, with Andrew Peterson as the Associate Director. In 2013, Derick Rehurek and Steven Kennedy assumed Associate Director positions. Robert Murphy took a position in Jamestown, ND in 2015. Derick Rehurek also stepped down as Associate Director to persue a directorship with the Minnesota Philharmonic Orchestra. Erik Peregrine assumed the directorship in 2015 after a short introduction as Associate Director in 2014. 2017 welcomes Myrtle Lemon as our new Associate Director in place of Stephen Kennedy who relocated to the New Hampshire. Myrtle is a 2017 graduate of St. Olaf with a degree in Music Education. Vocalists and instrumentalists come from many parts of the Twin Cities and western Wisconsin to practice each week on Saturday mornings. Over the years, the chorus and orchestra has formed an association with a group of singers from Renville County, MN, who perform with WCO at many of their concerts, as well as perform independently as the Woodbury singers. Richard Alton directs this group. They also collaborated with WCO members in the touring group, Woodbury Chorale and Bell Ringers, who presented concerts in Europe every other summer from 1994-2006. The Woodbury Chorus and Orchestra repertoire includes pieces of timeless appeal and enduring quality, from classical compositions, hymns, gospel and spiritual numbers and patriotic songs, to sacred and secular music of the present day. They give concerts primarily during the school year, in the metro area, greater Minnesota and parts of Wisconsin. In the tradition of the first Messiah performance, directed by its composer G. F. Handel in Dublin, Ireland, proceeds of the freewill offerings taken at concerts are donated to charity, primarily food shelf programs. Since 1985, WCO has received more than $495,500 in offerings at their concerts, which is enough money to buy over 2,495,500 meals. The group has raised funds for flood relief and several hospices, in addition to food shelves. New members are always welcome to join the chorus and orchestra, from teenagers through retirees. Auditions are not required in order to sing; however, instrumentalists need the director's approval. 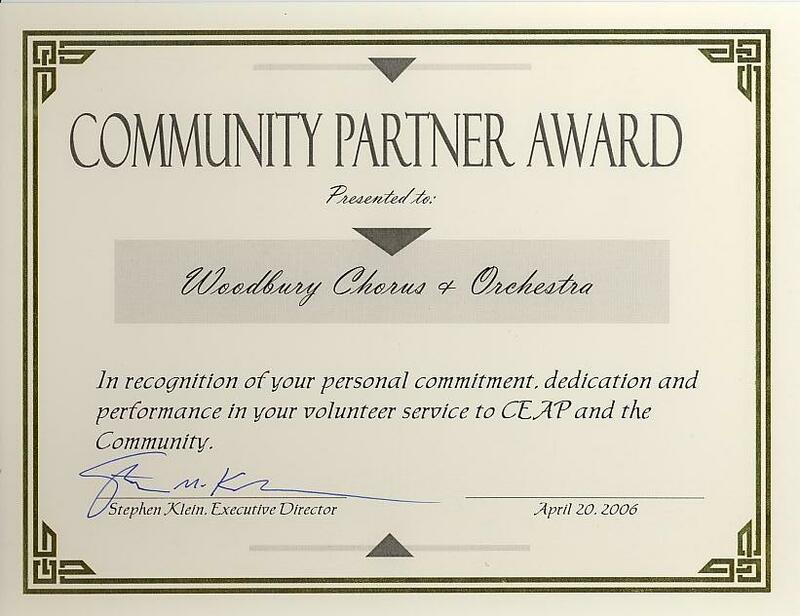 The Woodbury Chorus and Orchestra was incorporated in 1991 and received official non-profit status in 1992. The group welcomes inquiries from churches and other organizations interested in hosting a performance.